There’s a new home on the horizon that’s currently under construction and it’s going to be a ‘beaut’! The style of the home will showcase Victorian style architecture as it was intended. It’s being built by Bonner Custom Homes on a lot once occupied by two-50’s brick ranch style homes. Those two homes were demolished to make way for this very large project for the new owner. Regular readers might recognize the Bonner Custom Homes brand from my extensive coverage of the English cottage-style home that they built in 2006. 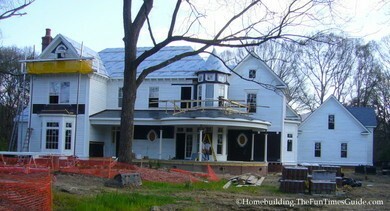 This new home will be as true to Victorian architecture as the homeowners will allow them to build it. Jerry Bonner, his son Rhett, and the rest of the staff are committed to staying true to Victorian style, just as they were true to English cottage style with his personal home…the English cottage. Just from my first visit to this Victorian style home the other day, I can already tell that this is going to end up being yet another special home that Bonner Custom Homes will put their stamp on. …and that’s only the beginning! I’ll hyperlink each feature above as I post it and add any additional links that may come up, so bookmark this page as ‘the home hub’ for easy access to come back and read all about it.